NOTE: Maybe title should be: full campaign vs "tasks only"
When asked how to get epic gems, I have always said that it is more "stamina efficient" to open hard campaign and limit yourself to the tasks that you can do* than doing full easy or normal campaign and then upgrade. *: without overkilling monsters or doing things that don't fit your playstile. I still think the same, but what if we factor in time? In the process of cleaning & updating the wiki I have read a page from Willbur (which I can't find tright now) where he stated (more or less, these are my words) that chaos gems were so game breaking that were worth the effort, even if it meant wasting stamina due to overkilling monsters. He concluded that gems were more important than gear and thus it didn't matter if that stamina would have killed 4 Vargulis instead of one. It makes sense to me, specially since the thresholds for legendary gems' bonuses have started to be shared. My method will, in the end, provide me the Legendaries I need, but at a ratio of 1 a year, more or less. Do you players think it is worth to save stamina and avoid those tasks from monsters? Does it make sense to deal that 15% damage in order to get the gem in just one campaign so you start taking profit from the bonuses earlier? Has anyone done the Maths? Is there any math-friendly approach to calculate this? I don't really know if I have explained myself correctly, please feel free to ask if needed. Chaos gems: full campaign vs "tasks only"
The other with might be misleading, as that is not the point I ended talking about. Last edited by Barathor; 10-29-2018 at 08:09 PM. How do you give thumbs up to a question? My approach changed pretty early on to just complete tasks within your reach, or taking advantage of the various lottery events taking place. So, I think I am with you on this. The answer being to combine what's possible to scale up your upcoming gear (with major boosts through the Legendary or Epic gears' threshold) with the highest calibre Gem you can load*. Then finish off with Enhances you have collected. Last edited by ॐ <Jigz of the Endless> ॐ; 10-29-2018 at 11:10 PM. Reason: For deleting: I'll def. reply back later in more detail. Value of chaos gems depends on activities you value. Only thing you can be guaranteed of in chaos gem is the elemental pierce or resistance. The two additional powers are random, so you can't count on them. Eventually, most gems end up being alchemy fodder and further on most legendaries end up being junk. Given the two additional powers are random, you might want higher number of gems to increase chances of getting good powers. If you can easily do Easy or Normal full campaigns but not Epic full campaigns, this might be a reason to go for Easy/Normal — you get more gems, thus more chances for powers you like. Another thing to consider is that Legendary gems only fit Legendary equipment. If you don't have Legendary equipment, then you won't have use for Legendary gems either. Legendary Equipment is possible for f2p pvp too, just takes more time than for others. Efficiency helps. So, eventually you will have some Legendary equipment but not necessarily for all equipment slots. You might want to count your Legendary equipment goals and see which ones would benefit most from which kinds of gems, as then you also will be certain which activities will always depend on less than Legendary equipment, thus Epic gems. Assuming you want pvp power (that applies to guild battles too of course), ability to Refine gems made it clear that higher grade gem is almost always better than lower grade one. 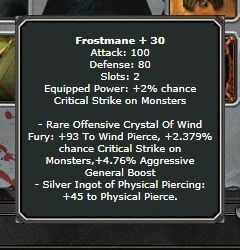 Rare has higher elemental pierce than common has elemental + lucky physical pierce put together. Epic more than Rare. Legendary more than Epic. So you're always going to want higher grade gems first, good powers second. Exception to this is if you get both physical pierce/resistance and base attack/defense bonus (or for those with low stats, agg/bal/def gen boost). You get to about one grade up through Physical Pierce/Resistance refined to max, so Rare offensive gem with PP and Base Attack boost would be better than Epic offensive gem with no additional pvp powers. Physical pierce/resistance is rare power, and getting two pvp powers in single gem is rare as well. Common gem without pvp powers isn't any better than Electrum Ingot. Not worth going for Easy campaigns for just pvp gems if you can do at least one Normal in time it takes to do three Easy ones. Still remember that partial Easy/Normal campaigns are almost totally useless due to very low number of shards gained — if you do partial, do Hard. If your goals lie in monster hunting, chaos gems can provide higher stamina per damage through Aggressive General Boost and increased Critical Chance. Legendary gems can go high enough to warrant Legendary equipment that has no innate critical chance bonus. If your goals lie in monster hunting, you probably build for that too. You'll have no problems doing excessive amounts of damage on monsters and should do full Epic campaigns anyway. For those not built for hunting monsters, monster hunting gems are still helpful. Common gems aren't scaling far in AGB or %CC, but they still provide some benefit. You can easily forge common to Elite Dragonslayer equipment and once you're through round one, replace them with higher grade gems as you get suitable ones. Additional benefits of chaos gems in monster hunting equipment are elemental pierce/resistance. You can hit some monsters with guardians in your best MH equipment (as you have suitable resistance to avoid guardians), and you get elemental weakness damage bonuses as well in your best MH equipment. Then again, they can hinder too when your best MH eq has elemental pierce of the kind the monster you're hitting has resistance for. Overall you gain more often than you lose, so it's net benefit. Then there are utility gems. If you're playing cleric in guild battles, having gems with Mass Heal or Heal bonus is certainly going to be useful. Major bonus here is that you can forge those to equipment you aren't using for pvp attack or defense, so there won't be any lost potential either. For Rogue, Warrior, and Mage the class skill bonuses in gems may require sacrifices: you may have to choose between +WW damage and +reach (through PP or base stat bonus) for example. It's still likely you have uses for utility gems as those sacrifices assume you actually have the perfect gems you won't be able to use — and you likely won't be having perfect gems for all slots in the next eternity. Because you can benefit from additional powers in gems even when your primary focus is in pvp power, it may still be beneficial to go for higher number of gems first, even if they are of lower grade. Most of the gems will be alchemy fodder, but you'll get utility gems to equipment in the process too. And once you have some utility gems (eg. three monster hunting gems and two cleric gems) and first round of pvp gems (of Rare grade, not of Common grade), you can move from Full Easy campaigns to Partial Hard campaigns, working more on better gems to fill utility loadouts with and replace low grade gems in all loadouts with higher grade ones with. Do not stay on Easy campaigns for too long. Even if you don't get the gems you hoped for, just move to slower process of higher grade gems instead of upgrading some loadout to Rare gems through alchemy from Common. If you can do full Rare campaigns easily, working on more gems instead of higher grade ones will make sense much longer. Afterall, any Rare gem beats Electrum Ingot by far. Still, there will be a time when you have to move on. On doing excessive damage vs loot damage on monsters, value varies. If you gain a lot still from new equipment and Item Archives, it's likely better to do partial Hard campaigns and spend stamina on getting better equipment and archive boosts. A lot depends on your goals, but doing 200M on a rat that you get full loot from with 36M doesn't seem reasonable if you're working on your first legendary equipment. But once your main loot goals lie in Thanatos Reborn and later, ie. monsters where you're going to do about 10% of health for full loot, doing 6x 15% is likely going to be more useful than 9x 10%. Problem in Hard campaign monsters at 15% damage is not these ones, but the easy and normal monster slots: you may be doing 15% on monsters you gain nothing at all from except essence and chaos tasks. You'll have to judge those yourself, as monster selection and your gains will vary from campaign to campaign. There may well be case for doing full Normal campaigns instead of partial Hard ones, as Normal campaign monster damage is 10% of health which for a large number of monsters is also good for loot. Just hope you don't get the wrong sets of monsters, as single missed full Normal campaign is one you could've done partial Hard during instead. Once you have pvp sets with Rare or better gems and reasonable set of utility gems (full sets would require luck even with huge number of gems), there won't be any reason at all left to do other than Hard campaigns, whether partial of full. Thanks Jigz and Elandal for you deep explanation. Food for thought! Regarding my build, I don't miss PVP at all since I started the shift towards MHunter. I can manage most people around my level in guild battles and that is enough now. The thing is discovering when to stop developing energy and stamina (or at least the first). When it comes to items, I still don't have all Elite Hunter gear and thus several legendary alchemies are still pending. My current guild has caps on most monsters so everybody can deal its damage and that is slowing me a bit, even though it makes perfect sense from a guild/community point of view. Maybe I will stick to easy monsters (damage for all loot under 35-36.000.000) to gather "fast" FPs before moving to higher goals. I guess I'll have to return to my excel sheets to plan ahead and schedule my goals in terms of equipment and IA and see how realistic they are and how much time they will take, combine long term with short term ones so I don't get bored or stagnant. For me the problem of normal campaign is top task, some task you just don't want do. so a full normal campaign is not that easy. That is Wilbur’s opinion, and not a statement of fact. I know for a fact these gems are not game breaking. As someone who does not have a legendary gem and probably won’t get them (because the gears that I want to put those legendary gems in are too hard to get). Here’s the bottomline: If you are not into PvP, the legendary gems lose a lot of value. In GvG, playing Mage or Cleric could beat players with lots of legendary gems (again, reinforcing the argument against game breaking). I’ll end with this observation: Malekus is a game breaking Atk General and after spending over 5,000 FP (combined over all toons), I only got one copy for my mini. My main has lived without Malekus and is doing just fine. My main is living and doing just fine without legendary gems too. In summary, get the gems at a sustainable pace without too spending too much on FP. Wilbur’s view on over-damage is so silly it’s laughable. You cannot always get everything. Play within your means and have fun. As someone who joined CA late (versus someone who being playing since 2009), I am at a disadvantage and that disadvantage never goes away. I will get legendary gems when I get them. This simple rare gem, easy to get, is nuts for a monster hunter. Last edited by Barathor; 10-30-2018 at 10:24 PM.